Top seed, favourite for gold, China’s Fan Zhendong justified his exalted position to win the Men’s Singles title at the Seamaster 2018 ITTF World Tour Platinum Qatar Open in Doha on the early evening of Sunday 11th March. At the final hurdle he beat Brazil’s Hugo Calderano, the no.13 seed, to seal the title (13-11, 12-10, 11-7, 11-7). Prepared to seize the initiative at every possible opportunity, Hugo Calderano made the best possible start; he established a 7-2 lead, Fan Zhendong reduced the deficit to 9-8; it may have seemed early in the contest but Jean-René Mounié, the coach sitting courtside advising the Brazilian called “Time Out”. Fan Zhendong was finding a rhythm to his play; he levelled at 9-all, securing the game after saving one game point at 9-10 in arrears and spurning a chance when 11-10 ahead. Immediately, Hugo Calderano responded, in the second game he went ahead 7-4; the powerful backhand very much in evidence, played down the line to the Fan Zhendong forehand it reaped dividends. Fan Zhendong, safe secure, as in the first game he recovered to level at 9-all and also, as in the first game, saved game point at 10-9. Once again Fan Zhendong recovered, now he led by two games to nil. Breathing space, arguably more relaxed, in the third game Fan Zhendong established an 8-4 lead; he never relinquished the grip. A three-nil lead was established. Recovering from a three games to nil deficit against Fan Zhendong, whatever your pedigree is one of the most demanding tasks in sport. Great credit to Hugo Calderano who fought for the cause, it was not to be, Fan Zhendong established a clear lead in the fourth game. At 10-7, having seen his charge lose two match points, Wang Hao, the coach sitting courtside, called “Time Out.” The break worked, Fan Zhendong won the next point, mission was achieved. It was for Fan Zhendong his tenth ITTF World Tour Men’s Singles title in what is now 15 final appearance: However, it is his first in Qatar; in both 2016 and 2017 he was the runner up beaten by colleague Ma Long, now at third attempt, the titles was secured. 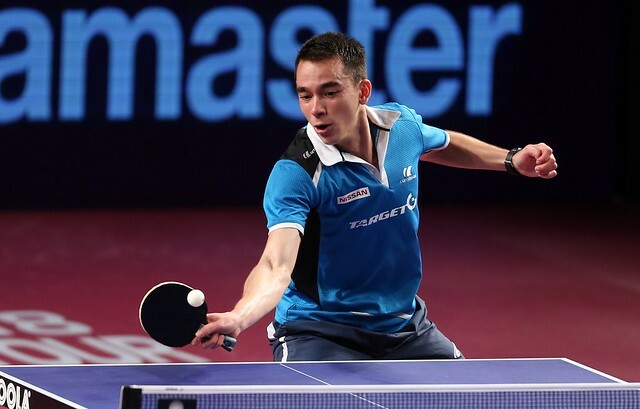 Furthermore, when the Men’s World Ranking list is issued for April 2018, for the first time in his career, depending on results especially from the Seamaster 2018 ITTF World Tour German Open later in the month, there is distinct possibility he will head the list.